I’ve always thought of Western civilization beginning with ancient Greece or Rome. But Thomas Cahill convinced me to take a historical step backward and consider the impact of the Jewish story as the true hinge upon which history turns. Prior to the Jews, pagan religions viewed the world as cyclical, repetitive, and uncontrollable. When Yahweh intercedes in the life of Avraham (then Yitzchak, then Yaakov), the unveiling of a monotheistic religion changes everything. History becomes linear, and a relational God that interacts with humans creates the possibility of real change and human responsibility. Anyone interested in history, culture, or religion will find this fascinating. Cahill is a phenomenal writer, working his way through history with just enough time to appreciate what happens without dawdling. His adherence to Hebraic terms (like the names of the patriarchs above) gives readers enough space to view the story with new eyes. As a seminary student, I view the Bible almost exclusively through the eyes of application: what can we learn from its stories? 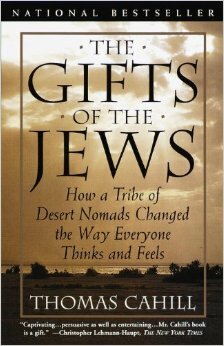 The Gifts of the Jews broadened my appreciation, helping me to see that history itself was changed by this unique people group.